World War Two is a popular time period to serve as the focus of a strategy game. The largest military conflict in human history, between 1939 and 1945 the war saw Europe in flames. In Asia the war began sooner and ended later, and saw much of China, Japan, and Oceania demolished between 1937 and 1945. The stakes were high throughout the conflict, each combatant had its own objectives it sought to achieve during the fighting, and entire countries were conquered – sometimes more than once – by combatant powers. And the years of actual warfare were not the only times of high drama and tension. The 1930's saw increasingly violent conflicts break out across the world with ever more lethal consequences for people caught in the middle. And the postwar environment was perhaps even more tense, what with the threat of atomic war growing with each bomb assembled and each nation that joined the nuclear club. Although in retrospect the course of history during the 1930's through 1950's seems set in stone, very small tweaks to historic events could well have led to dramatically different outcomes. All this makes playing through any strategy game dealing with the period attractive from a "what if" sense, and especially with a big, wide open game like Hearts of Iron II. 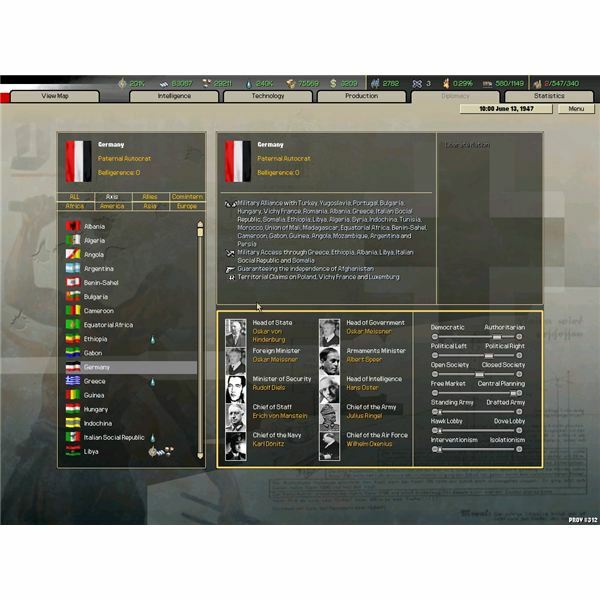 Directions that we accept as historic inevitability can be altered in small or major ways during the game, which while being capable of simply re-fighting the Second World War is sufficiently customizable to provide an incredible alternate history type of experience. 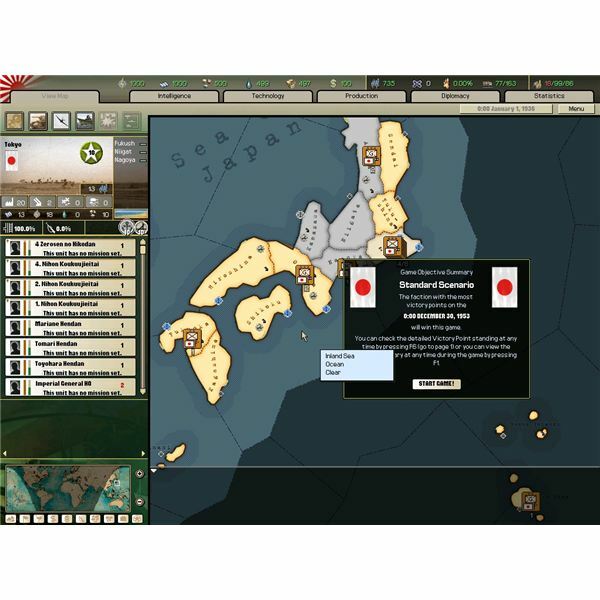 Playing through Hearts of Iron II as one of the major powers of the period between 1936 and 1953, while being aurally pleasant due to the excellent Hearts of Iron 2 soundtrack, is also gripping as decisions are made and paths taken that are at odds with true history completely alter the face of the hypothetical world HOI 2 models. Hearts of Iron II can be customized to suit the user by inputting certain cheat codes and event triggers, which can alter the starting territory of a given nation or even kill off Hitler before his time (though no sooner than the world can wish he'd left this mortal coil). This means that the directions the game may take are largely dependent on the starting conditions decided upon by the user at game start. 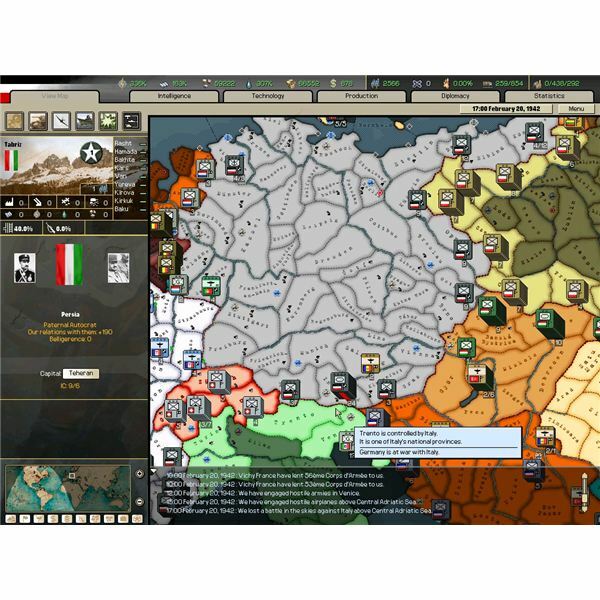 Paradox Interactive has done a good job of setting up historic starting positions, military strengths, alliances, and governments and these do not necessarily need to be changed in order to have a good alternate history experience. This is because the course of events is inherently due to random chance and luck on the battlefield, as well as skill on the part of the player. Tweaking the setting is as simple as triggering events or manually forcing land swaps, but the natural setting itself is quite compelling in and of itself. Hearts of Iron II starts in 1936, which is an important year in European history because it saw several signal events: the Spanish Civil War, the German Reoccupation of the Rhineland, and Stalin's ongoing purges coupled with the Soviet Union's rapid industrialization. From 1936 the game continues (assuming the integral expansion Doomsday is installed, and this article assumes it is) on to 1953, which historically was another important year because it saw both the death of Stalin and the end of the Korean War. In all, eighteen years are modeled in Hearts of Iron 2, with the soundtrack going the whole time and adherence to historic direction at the whim of the player. In Hearts of Iron II, directions with respect to a country's military, economic, and political development are randomized within a set of constraints when it comes to the AI, and completely up to the user when controlling the player country. Personally, I've seen the AI, without prompting from me (I was playing Germany), end up having the Allies (France and Britain) declare war on the United States in the Mid 1940's, while simultaneously fighting a war with Imperial Japan. The United States has experienced a fascist coup in at least one game, the Spanish Civil War often ends in a Republican Spanish victory (not at all this historic outcome!) and Japan sometimes waits until 1942 or 1943 to attack Pearl Harbor. This illustrates the wide open nature of history after 1936 when a game of Hearts of Iron II begins. Even without tweaking the starting conditions, numerous factors affect the course of in-game history. For the player, one of the first directions to consider and decide upon is political: how should the country look in ten years? 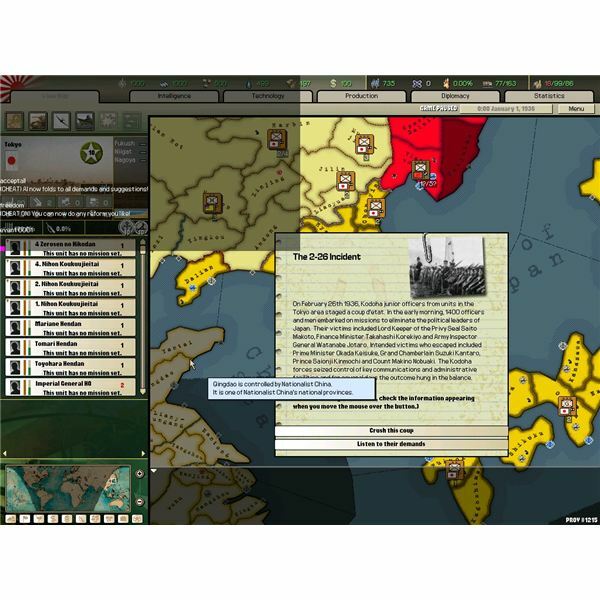 Governmental types and dispositions, including production bonuses or unit experience modifiers, are determined through a series of sliders on the diplomacy screen for the player nation. One slider can be adjusted one click in one direction each year, and it is important to remember when it is time to make a new adjustment because time lost is gone – the counter for the next year only starts when an adjustment is made. These slider changes may not seem like much, but over the course of the game they can mean that a pure communist nation can liberalize economically and politically and become a capitalist democracy. Nations can be taken from peaceful and isolationist to warlike and interventionist, and economies can be opened or closed to the world. Alliance chances and relations with other nations depend in part on the type of government and ministers change depending on the political state of the nation. Any player in HOI 2 needs to be aware of the subtle, long term effects of slider adjustments and plan accordingly. Changes made at random will be less interesting than those made as part of a plan, a desired movement in some direction for the country being played. Development Directions: Become a Naval Power? Or Make Lots of Money? Once the overall political direction has been determined, the player has to figure out what direction to take the country when it comes to its industrial strength. Hearts of Iron II revolves around the production of infrastructure developments and industrial products, the latter including both commercial goods to keep citizens happy and placid as well as military units to protect the borders. Production capacity is represented by a number if IC points – the more there are the more can be built at any one time, and the more transportation infrastructure will be available to provide supplies to military units and far flung provinces. HOI 2 is above all a military grand strategy simulation – the player won't be converting the nation to an agricultural paradise, but developing the most robust industrial machine possible to field the most potent military the country can support. After all, sooner or later war will break out between 1936 and 1953, and when it does the battles will increase in intensity to encompass the entire globe. When that happens, the wise leader has a military force capable of defending the homeland. And, naturally, an aggressive dictator will want a military force capable of taking over someone else's homeland. The Hearts of Iron II directions when it comes to military power are incredibly multi-faceted, but can be boiled down to several basic pathways. First, there is the "Strong Army" path. This involves research into infantry equipment and tank forces, and constructing divisions that can be placed under the command of a good leader and sent to the borders. Next there is the "Air Superiority" path. This requires major research into aerial tactics and advanced combat aircraft designs. When war breaks out, the Air Superiority Proponent annihilates an opponent's aircraft, ships, transportation infrastructure, and economy with relentless air attacks, perhaps supplemented by airborne assaults by parachutists. The third path can be summed up as "Sea Power," and as one would expect is characterized by building fleets of battleships and aircraft carriers capable of dominating the oceans and backing amphibious assaults. Granted, the above approaches do represent an over-simplification: successful leaders will integrate the three approaches and favor those that make sense based on the geography of the player's country. But still, emphasizing one pathway or another tends to be necessary since there are only so many resources available and many potential enemies. Choosing an unexpected direction to take a country's government and military makes Hearts of Iron 2 such a fun exploration of alternate history. "What If" scenarios can be concocted to a player's interest of the day. For example, what if Germany had built a first class Navy in the 1930's and invaded Britain rather than France? What if the Soviet Union had conducted a strategic bombing campaign against Germany? What if the Allies had decided to join with Germany in attacking the Soviet Union and launched amphibious assaults against Siberia and the Kola Peninsula? The possibilities are endless, and this is what makes Hearts of Iron II so enjoyable.